The dog news just keeps pouring in tonight! 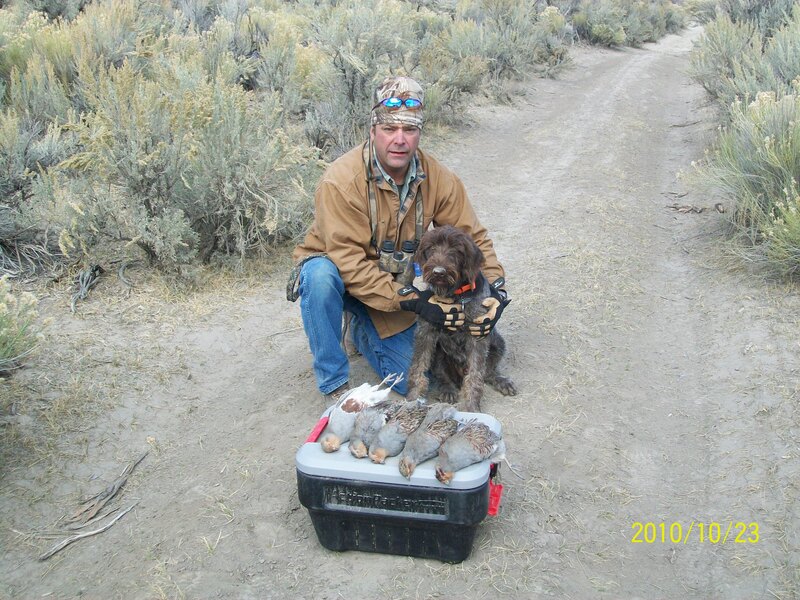 Just got a great shot of 2010 litter alpha male “Whiskey” and Pete out in Nevada who got into some Hungarian Partridge over the weekend. Great job guys! We’ll be out visiting my grandparents near Yosemite, California the summer of 2011 and I hope we get a chance to swing by to visit Pete. I really want to have a good look at Whiskey. It excites me to see the rough sagebrush country that he has to work in and his coat doesn’t show any signs of wear and tear. Weak coated dogs would have balding or bare patches on the shins of their front legs, but I see no sign of that here. His head furnishings are beautiful. I am very excited for what Sue and Sam have produced and absolutely ecstatic about the great job Pete is doing with the dog.